When closing the review of the debut record from Altar of Oblivion Sinews of Anguish I stated that the next album, not so rooted in the singular theme and musical aesthetic, will be an indication whether this Danish collective can join the list of my most listened to traditional doom metal acts. Grand Gesture of Defiance has answered that question very much in the affirmative, whereas Altar of Oblivion style of doom have shifted even more to the epic aligning itself closely with Candlemass, Memento Mori, Memory Garden and Trouble, while also borrowing a little from the early Tad Morose. What Candlemass fan would not be happy listening to the bearish gait of the opener Where Darkness is Light? 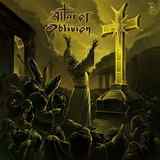 Grand Gesture of Defiance shows Altar of Oblivion eschewing a super-uniform riffing style, which defined Sinews of Anguish almost entirely. The old riff pattern makes a brief appearance in Sentenced in Absentia, yet Martin Mendelssohn and company exhibit a lot more variation on this record, if not in overall style then certainly in how the songs unfold and present themselves. Still rooted in clean skilled guitar playing where melodies are soaring and solos amplify the songs, the tracks on Grand Gesture of Defiance display enough variation in patterns and tempos that the album's 35 min fly by leaving you wanting more. Where Darkness is Light and Sentenced in Absentia are heavier, In the Shadow of the Gallows is much more monumental, somber and reflective, while The Graveyard of Broken Dreams makes a grand statement as an album centerpiece. It is songs like this which make you a fan of the genre. The band almost never deviates from its clean, classy, yet powerful, palette, although the acoustic The Smoke-Filled Room unexpectedly shows off some note bending midway. If there is a knock at all on Grand Gesture of Defiance, it is almost too reserved. The bass could have been a touch more active, as evidenced in its successful rumbling in Sentenced in Absentia. Drums are careful not to get carried away, but the rolls in In the Shadow of the Gallows show that coming at you in waves can be a strong point for Altar of Oblivion. Mostly, Mik Mentor's vocals tend to be confined too close to the middle. His voice does not quite have the power of Messiah Marcolin, he doesn't reach too high or scrape super lows. Yet when he does let loose on the chorus of Sentenced in Absentia, his English accented and all, he touches more of the nerve. It is perhaps this lack of emotional outbursts which places Grand Gesture of Defiance a touch lower on my totem pole than another recent doom album released by Shadow Kingdom, the one by Pale Divine. While no doubt a lot more epic, Grand Gesture of Defiance is significantly less personal than Painted Windows Black. I am thinking, however, that Altar of Oblivion has potential in that department as well, just listening to how ginger beginning of Final Perfection runs into the gamut of rare heretofore double bass only to let the soul fly out in the end with angelic choral closure. Grand Gesture of Defiance is a solid move forward for the Danes and if you are a fan of any of the famous acts mentioned in this review you can't afford to miss this album.